For cloud based monitoring using Appenlight, sign up for an account first and get your user details. 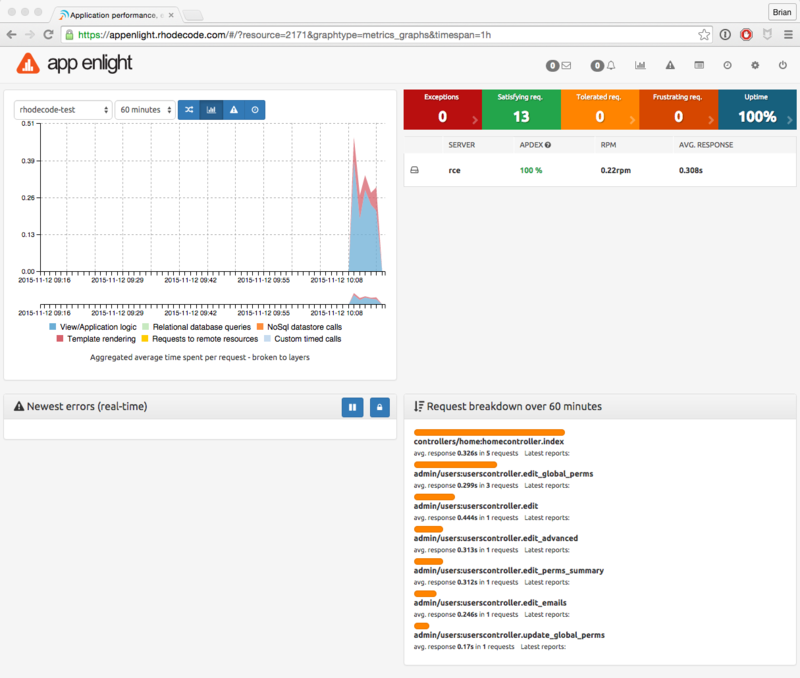 For self hosted monitoring, you’ll need to download and setup Appenlight first. Contact support@rhodecode.com for more details. Add in your RhodeCode Enterprise instance details. Take note of the Public and Private API keys on the application page. You will need to add the private key to your RhodeCode Enterprise configuration file. For more information, see the the Appenlight documentation here. Once you have your Appenlight account details, configure the RhodeCode Enterprise home/user/.rccontrol/instance-id/rhodecode.ini file with the following details to set up the connection between the two systems. The section below should already be present in your configuration file if running a recent version of RhodeCode Enterprise. Enable the Appenlight connection by setting appenlight = true. Set your Appenlight URL using the appenlight.server_url = URL option. Set your Appenlight Authentication Token using the appenlight.api_key = TOKEN option. Once RhodeCode Enterprise and Appenlight are working together you will see the monitoring begin on your Appenlight dashboard when you start carrying out actions in RhodeCode Enterprise.